One More Folded Sunset: Ideal Properties? Familiar faces. Little 115 16th Street & its twin, 117, surviving (just about) in frenzied times, seemed likely to end up razed for new construction, but maybe the size of their lots would save them? Bounced around for years, victims of many a dubious deal, they were recently on the market for $2,500,000. Last month records of recent activity appeared on ACRIS. 117 sold for $655,000 & 115 was transferred by deed (no price recorded). Same owner for both properties. 115, one of those curious properties with no DOB history whatsoever, was fixed, cosmetically at least, some time last year, but adjoining 117 is in perilous shape. FAIL TO MAINTAIN BLDG WALL OR APPURTENANCES. NOTED APPROX 30% OF ROOF U5 MISSING. FRONT FACADE HAS SEVERAL CRACKS. A little worrying to live next to, I'd say. But if this sort of thing doesn't bother you, you'll be pleased to know that 115 is now available to rent, at a piddling $4,500 per month! AMAZING 3BR, 2 BATH TRIPLEX IN GOWANUS! It's a small house, as you can see. I'm curious about the mention of a garden space, because according to the floor plan, there doesn't seem to be any access to a garden, & the lot (565 sq. ft.) seems too small to include one. Maybe the "garden" is the deck - 7' x 10' or so at most - accessed through the kitchen on the first floor. Oh, how I'd love to show that deck here, but loathe to offend, I can only offer a link. Let's just say that it's enclosed. There are several pictures of the deck included in the listing, but the aerial shot has to be be my favorite! It's the sixth picture in the sequence. Amazing? Maybe so, maybe so. Strangely enough, there's also a Postlets listing floating around online for 117 (the house with a third of its roof missing).. The pictures show the 115 interior, and the price is also $4,500. 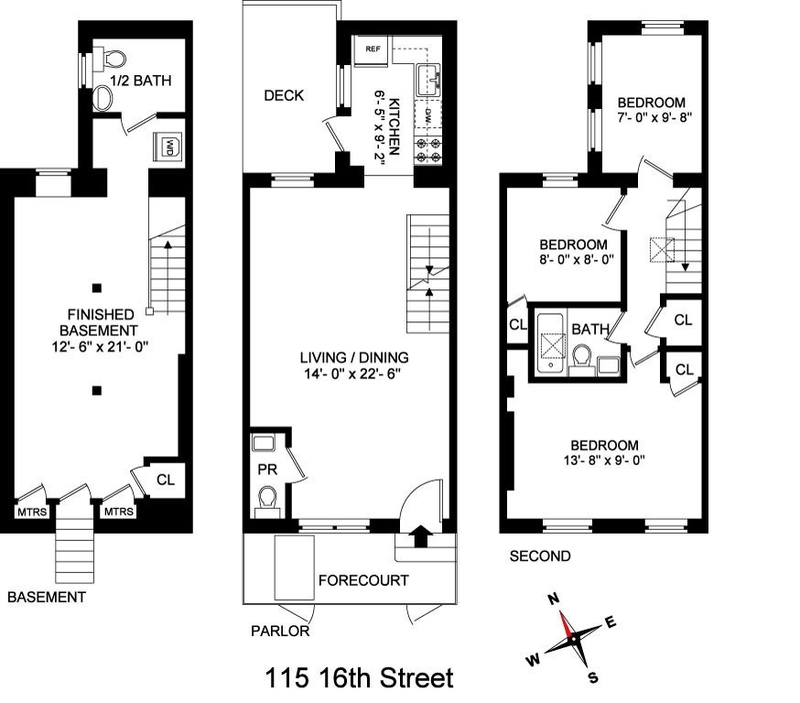 The square footage of the house is given as smaller than 115. 117 actually has a bigger lot than 115 (right behind 115), but no garden is listed - only a patio. but if you take a closer look, it doesn't seem that promising.